The first time I had New York cheesecake is quite a while ago – it was love at first sight! When I was fourteen I traveled to New York and Canada with a friend of mine and her family. As soon as I took my first bite I was hooked and during the following three weeks of our holiday I don’t believe I left out a single chance to get a piece of cheesecake, every day, at every restaurant we went to. I became a true cheesecake specialist! Now, when I bake my own, I’m always reminded of that trip and the excitements of being a traveling teenager. 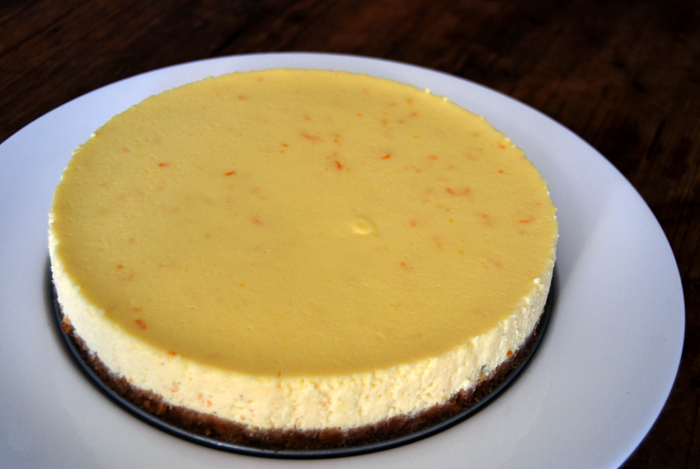 Over the years I tried out many cheesecake recipes and developed my own favourite with orange zest and juice and cream cheese mixed with ricotta. It is still as rich and moist as the traditional version, the citrus flavour just adds a fresh, fruity specialness and gives it a lighter feeling. Mix the crushed cookies with the melted butter until crumbly and combined and press into your springform pan. Put in the freezer for 15 minutes. Set the oven to 165°C / 330°F and put a deep roasting tin in the oven on the lowest position. Boil water in a kettle. Mix the cream cheese, ricotta, sugar, vanilla sugar, salt and eggs and beat until smooth. 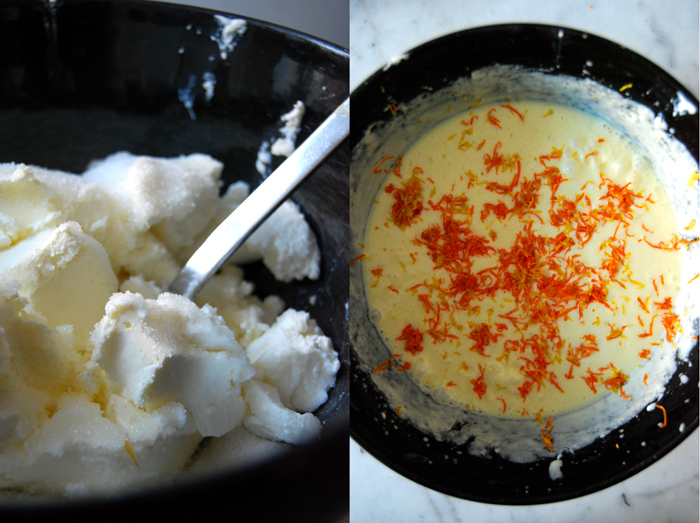 Add the cornstarch, lemon and orange zest and juice and continue mixing. Take the baking pan out of the freezer and wrap in aluminium foil twice so that the bottom and sides are well covered to protect the cheesecake from the water. 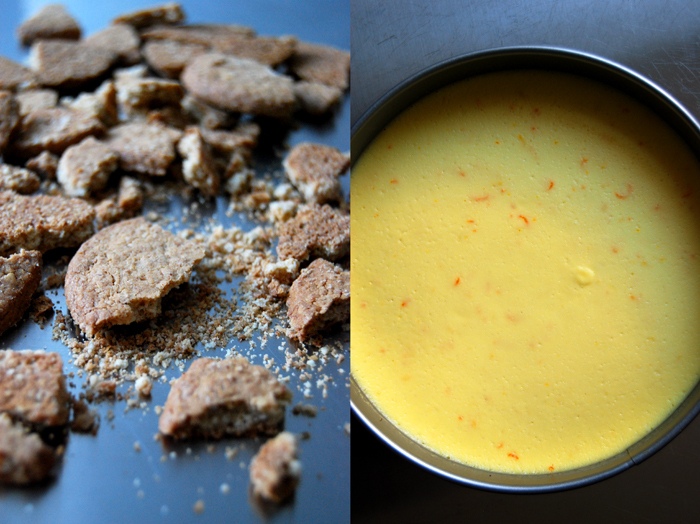 Pour the cheesecake mixture on top of the hardened crumbs and place carefully into the tin in the oven. Fill the roasting tin with the boiling water from your kettle. The water should come half way up the wrapped springform pan. Bake for 50 minutes, switch off the oven and leave the cake in the oven to cool. After around an hour you can take your cheesecake out and chill in the fridge for a couple hours. I am anxious to try this…anything orange flavored is my favorite! You should, it tastes so good! 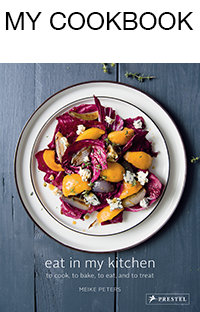 At the moment I love to cook and bake with orange zest, I guess it’s a winter thing. I will make the cake again for a dinner party on New Year’s Eve!